Well, it was bound to happen. I woke up this morning without the sun rays beating down on my face. It was grey and raining. 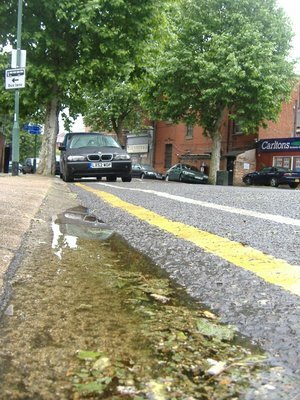 I will admit that I have exaggerated the dryness here in London to this point. It has actually rained a couple of times in the two and a half weeks I have been here, but those showers were over within an hour or so, and were book-ended by clear and sunny periods. This has been the first day where the whole day, from start to finish (or at least to 6 o'clock in the evening, when I am writing this) has been grey and rainy. The rain had slowed to a drizzle around 11 o'clock, so I decided to put on a warm sweater and rain proof boots and go out for a walk. I headed down to Kilburn to find an HSBC bank machine and test out my new ATM card, which worked without issue. Sweet, I know have the ability to withdraw money over here in the UK without paying a $5 PLUS fee and a 3% foreign exchange rate charge. 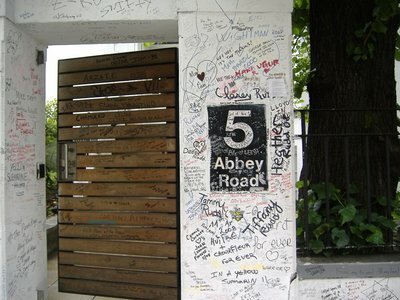 Just kidding, it lead to 3 Abbey Road, which is the home of the famous Abbey Road Studios. The sight is on the pilgrimage trail for Beatles fans, and many of them leave their mark on whatever surface they can find, including the neighbours walls. 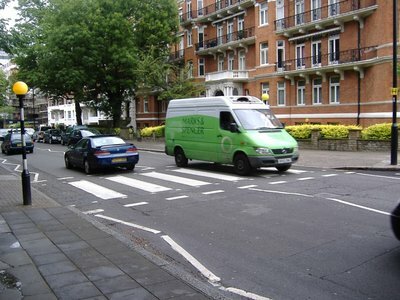 In addition to being a place where the Beatles (among many others) have recorded, Abbey Road Studios are famous for what is out front of the building, a cross-walk. 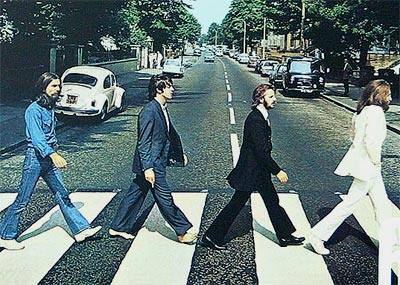 Not just any cross-walk though, the zebra crossing pictured on the front of the 1969 Beatles' album "Abbey Road." I snapped a photo of the zebra crossing. I was surprised how busy the street was, but then I guess that's why there is a cross-walk there. If the street wasn't busy, there wouldn't be much call for putting in a pedestrian crossing zone, I guess. ...and then down Park Road, which turns into Baker Street. The thing about 221B Baker Street is that there never was such an address. At the time of Conan Doyle's writings, there was no such address, and so Conan Doyle probably choose it for the fact that it didn't exist. Street numbers were reallocated along Baker Street and Upper Baker Street in the 1930s, which lead to there being numbers up in the 200s along Baker Street. 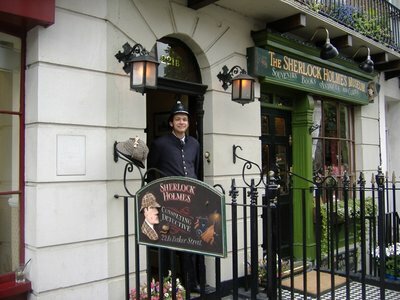 There is a Sherlock Holmes Museum on Baker Street that claims to be at 221B Baker Street, but it's actual address is 239 Baker Street. While city statues prevent anyone from displaying a false address on their premises, the Sherlock Holmes Museum does have 221B on their door. They accomplished this by registering a company with the name 221B Ltd., and thus the "221B" that appears above the door of their premises is simply the name of the company that operates out of that abode. If 221B were to exist, it would be somewhere in the middle of what is now a rather large building, encompassing the street numbers from 219 to 229. The Abbey House was built in the early thirties to be home to the Abbey Road Building Society, which over time morphed in the Abbey Bank. Abbey Bank, interesting, is apparently one of the other banks where it is easy as a foreigner to open a bank account. Abbey Bank was in the building until 2002. 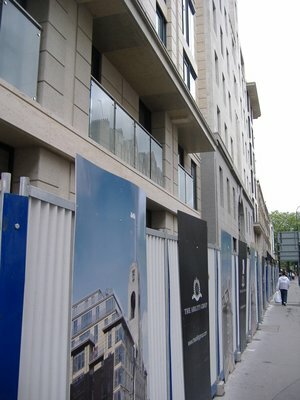 The building is now undergoing renovations to develop "92 luxury residential units and 40 affordable units with 3 levels of underground car parking," according to a web page run by one of the mechanical companies assisting with the build. Not quite as glamourous to imagine Sherlock Holmes living in a sixth floor luxury residential unit with ample parking and a private elevator as it is to see him in a nice Georgian-era home with a sitting room, fireplace and lots of old books weighing down the bookshelves, so I am willing to forget the facts and buy into the mythos. The nice old house with the bobby standing out front is where Holmes lived, not the fancy new apartment block. 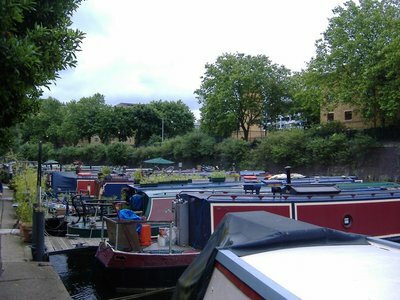 During my walk the rain mostly kept itself to a low drizzle, but then the rain started to fall a little heavier, so I caught the Jubilee line back up from Baker Street Station to Willesden Green, and on to my flat. I settled in to watch the F1 qualifying, which seemed a reasonable thing to do on a rainy day. After all, I can waste a day sitting around the house doing nothing. I have years ahead of me to explore.